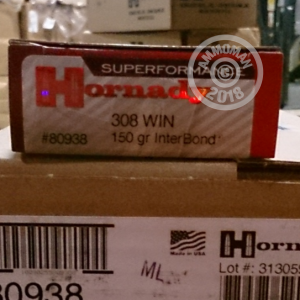 This is Hornady's Superformance InterBond 150 Grain 308 Ammo. The InterBond line from Hornady utilizes a bonding process that prevents jacket/core separation and controls the expansion, allowing the bullet to retain most of its weight and deliver a deep, powerful punch upon impact. Each projectile also features a polymer tip to improve the accuracy and perfomance. This ammunition is non-corrosive, brass cased and boxer primed. Hornady manufactures all of their products with the highest quality components in Grand Island, Nebraska. They produce premium ammunition to hunters, competition shooters, law enforcement agencies and military branches. Pick up this case today and get Free Shipping from AmmoMan on your order over $99!